Tuesday 8 The heat which has been moderate, is again on the increase. The news from all quarters is very megre, even our camp news is very scarce, the old camp monotony is still hovering over us. The political excitement in the north seems to be on the increase, the peace men are making great efforts to gain the coming gubernatorial elections. But they will certainly fail. The "Democrats" (?) 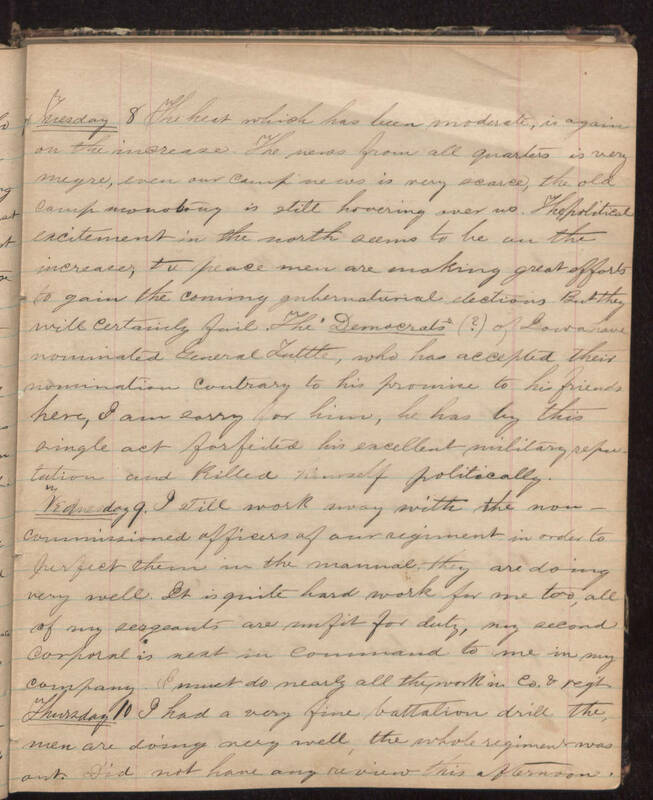 of Iowa have nominated General Tuttle, who has accepted their nomination contrary to his promise to his friends here, I am sorry for him, he has by this single act forfeited his excellent military reputation and killed himself politically. Wednesday 9. I still work away with the non-commissioned officers of our regiment in order to perfect them in the manual, they are doing very well. It is quite hard work for me too, all of my sergeants are unfit for duty, my second corporal is next in command to me in my company. I must do nearly all the work in Co. & reg’t. Thursday 10 I had a very fine battalion drill the men are doing very well, the whole regiment was out. Did not have any review this afternoon.